The Avere Control Panel’s Support tab contains tools to help you work with Avere Global Services to investigate and fix problems that might occur with your Avere cluster. In addition to providing Avere Global Services contact information and documentation links, the Support tab provides interfaces for uploading system information to Avere’s technical support department to help Avere’s support engineers assess your situation. To read product documentation, or to contact Avere Global Services for software support, use the contact information listed on the left side of the page. 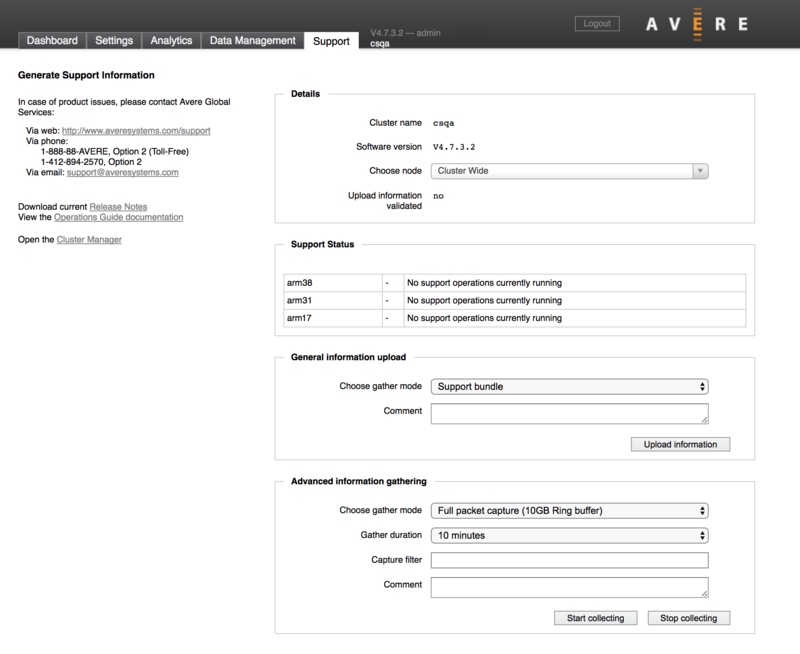 The behavior of the Support tab also relies on the configuration settings in the Cluster > Support page (under the Settings tab of the Avere Control Panel). Use the settings page to turn on monitoring options that gather the information that can be uploaded from this page. The controls on this page should be used in conjunction with Avere Global Services. Follow their directions when using any of these features. The first section on the Support tab gives basic information about the cluster and allows you to change the scope of the information gathered and uploaded to Avere Systems for support purposes. In the Choose Node selector, you can select a single node to examine, or Cluster Wide to investigate all nodes in the cluster. This selection affects the nodes that are shown in the Support Status table and also the scope of the information uploaded to Avere Systems. If you select a single node, only that node uploads troubleshooting information to Avere Global Services. If you select Cluster Wide, every node in the cluster uploads the information. Note that you must select a node in order to upload core files. The Core dump management panel (described below) does not appear if Cluster Wide is selected. The Upload information validated status message shows whether or not Avere Global Services has successfully received information from the cluster. If it reads “no”, check the Customer Information section of the Cluster > Support settings page to retry the upload or work around failures. The Support Status table shows the status of support information uploads for the selected node, or for all nodes in the cluster (if Cluster Wide is selected in Choose Node). Use the General Information Upload section to send system information about the node or cluster to Avere Global Services. The manual uploads available from this page supplement the automatic nightly uploads that you can configure on the Cluster > Support settings page. If you select the Statistics Monitoring or General Information Upload checkboxes in the Customer Info section of the Cluster > Support settings page, Avere OS automatically uploads the selected data to Avere Global Services each night at approximately 1:00 a.m. local time. Choose the type of information to upload with the Choose gather mode selector. Options are described in detail below. Optional: Type a note for the upload in the Comment text field. Click the Upload information button. The “gather mode” setting lets you choose what information will be uploaded. Note that collecting the information for these uploads is enabled or disabled on the Cluster > Support settings page. If you select statistics upload on the Support tab but you have not configured statistics monitoring on the Cluster > Support settings page, your upload will contain an empty statistics report. Use the Customer Information section of the Cluster > Support settings page to turn on information collection for the items you want to upload. This option uploads the Normal support information package, plus the Current statistic information package. This option does an immediate manual upload of the General Information Upload data that can be set for nightly upload from the Cluster > Support settings page. Up to four days’ data is included in this upload. This option uploads the same information in the Normal support information package, but does not restrict the uploaded data to the most recent four days. Uploads statistics information collected since 1:00 a.m. (that is, since the regular nightly upload). Note that you must turn on statistics collection and nightly upload on the Cluster > Support settings page to populate this report. Uploads rolling trace information for a configurable time period. The default time value is ten minutes before and two minutes after the current date and time. Uploads management trace information. You can configure the time period; the default value is ten minutes before and two minutes after the current date and time. The Advanced information gathering panel can be used to collect additional information for uploading. In general, you should use this only when directed to do so by Avere Global Services, and with the settings they recommend. This panel lets you to gather more specific data for a set period of time (or indefinitely, until stopped). Each of these options gathers program execution data according to the option selected. The trace options on this menu are disabled if Gather rolling trace data is enabled on the Cluster > Support settings page. That is, you can either capture rolling trace data for the cluster or capture the specific data in these options, but not both at the same time. Until manually stopped - Data collection continues until you click the Stop collecting button. Most gather mode options have a default time of ten minutes. Click the Start collecting button to begin data collection. You can use the Stop collecting button to quit collecting data at any time. The Core Dump Management panel appears only if a single node is selected in the Details section. Use the Core dump management panel if you need to upload a core file after a failure. You can also use this section to delete core files. The Select core field automatically loads a list of core files on the node, if any exist. Use the drop-down selector to choose the file to upload or delete. Optionally, you can add a text note for the upload in the Comment field. To upload the core file to Avere Systems, click the Upload core button. To delete the core file from the node, click the Remove core button. 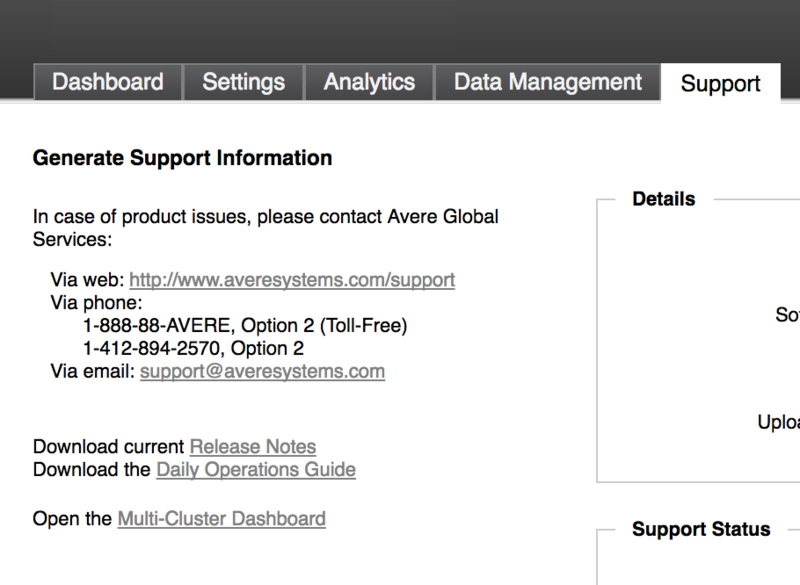 The information in the left margin of the support page explains how to contact Avere Global Services by phone, web, or email. It also includes links to documentation, such as the Release Notes for this version of the software, and the online Configuration Guide. Additional documentation can be found at http://azure.github.io/Avere/. The Multi-Cluster Dashboard link opens a system viewer that allows you to monitor the health of multiple clusters on one page. Detailed documentation for this cluster manager is being developed.